1. Here’s a strong rebuke against the F-35 program, which is laid out here as (and certainly appears to me to be) the epitome of Washington’s systemic bloat, bureaucratic stupor, and institutionalized cronyism. Even early supporters of the system like Canada are today struggling to make the final decision over its ultimate purchase, and articles like this help make the case against it. The F-35 is irredeemable. Contrary to the conventional wisdom on the Hill and at the Pentagon, there are practical solutions that can replace the failed Joint Strike Fighter project quickly while creating tens of thousands of jobs and filling America’s national-security needs (more about that in my next article). That said, no stronger message about reforming our broken defense-procurement process can be sent than by canceling the dumbest fighter program ever conceived. 3. Lots of way-too-early speculative tweeting about the Florida airport shooting, as usual. And as usual, lots of politics trying to come into play, way too early. 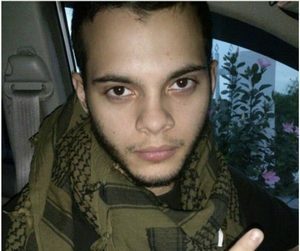 Aside from the usual “is he a terrorist?” race, there’s also the left’s sources talking about gun violence as if they’re just chomping at the bit to use this latest incident to get right to their gun control fetish again; and as a general matter they’re also hoping he’s a right-wing gun-nut whitey. And some righties are hoping he’s another Islamist terrorist, which is far more likely — but each side uses these things to help advance their agendas. The most striking tweets are identity-politics-based crap, touting that this (at above right) happened. It might have, because CNN and the entire left is about identity politics, but I didn’t see it. 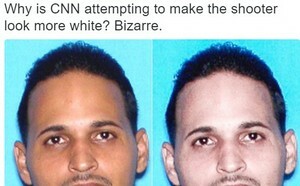 For example CNN is reportedly going with a picture (warning, it’s coming from BuzzFeed, so…) showing him as at left — a pretty non-white male — although I couldn’t find that exact picture on CNN’s website. 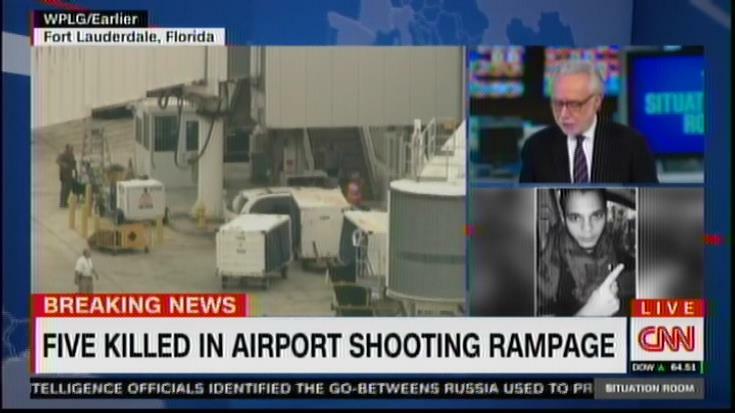 On air CNN is in fact going with that picture at left — but it’s a black and white version of it it, for a reason I cannot fathom (see below). I mean clearly, you have to modify a photo from color to black and white, and have a good journalistic reason for doing so. CNN is broadcast in living color, after all, so it’s not a technical matter. I’m sure the reason is real journalistic-y and Brian Stelter will not feel the need to examine it. I mean unless Fox News Channel does the same thing in which case he’d have to do a ten-minute-long commentary about it and then be given another 20-minute multi-party panel with Wolf in the Situation Room (Fox didn’t do that — I checked). I’ll go out on a limb and predict that we’ll find out there was some indications, somewhere along the line, suggesting that he had something dangerous about him going on — an ISIS connection or mental instability or something we’ve seen before.